• The Norman Foster Foundation presents the second edition of its annual Digital X Workshop with public debates in which practitioners from the fields of design and innovation will participate, including Amber Case, W. Daniel Hillis, Mary Lou Jepsen, David Moinina Sengeh, Nicholas Negroponte and Ben Vickers. 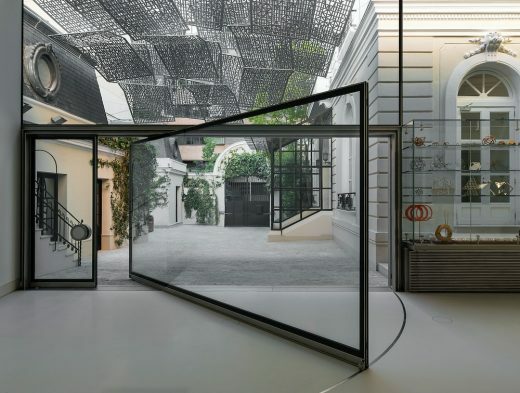 • The 2019 Digital X Workshop is designed to pose key questions and come up with some considered conclusions in a week-long event hosted in the Madrid headquarters of the Norman Foster Foundation. • A distinguished group of specialists will engage with ten selected students from ten universities around the world who share a common interest in the subject. The workshop mentor is Nicholas Negroponte, co-founder and former director of MIT Media Lab. The second edition of the Norman Foster Foundation Digital X Workshop will take place on 18-22 February 2019, in association with e-flux Architecture. With that concept as a background, the workshop is designed to pose an key questions and come up with some considered conclusions . Can you build a city without infrastructure: no roads, no sewers, no water or power? Why bother? The answer is to renovate slums without bulldozing them, which is something that could impact two or three billion people. Call it a new autonomy, that of a house or a small community, taking some pages from outer space and bringing them back to earth. After reviewing applications submitted by hundreds of candidates from around the world, the selection committee awarded ten scholarships to students from the following universities and institutions: American University of Beirut, Beirut, Lebanon; American University in Dubai, Dubai, United Arab Emirates; Ashesi University, Berekuso, Ghana; Cambridge University, Cambridge, United Kingdom; Cape Town University, Cape Town, South Africa; Delft University of Technology, the Netherlands; George Washington University, Washington, DC, United States; Illinois Institute of Technology, Chicago, IL, United States; Polytechnic University of Madrid, Madrid, Spain and the University of Hong Kong, Hong Kong, China. These ten students will be asked to park reality at the door. Inviting them to bring their most advanced thinking, craziest ideas, whether they relate to architecture or not, to apply them, their derivatives or simply their point of view to the needs of the world’s poorest people, especially the increasing number who live in slums. The Digital X Workshop will include seminars, lectures, one-to-one tutoring and architectural tours to learn more about the context of Madrid culminating in a five day workshop led by the Atelier mentor, Nicholas Negroponte, co-founder and former director of MIT Media Lab. e-flux Architecture will join this year’s edition of the Digital X workshop as its editorial partner. Editors Nikolaus Hirsch and Nick Axel will conduct a series of interviews during the duration of the workshop, the result of this joint initiative will be unveiled in Spring 2019. Tuesday 19 February 2019, 12:30 p.m. – 2:20 p.m.
With the participation of Amber Case, W. Daniel Hillis, Mary Lou Jepsen, David Moinina Sengeh, Nicholas Negroponte and Ben Vickers. Tim Stonor, Managing Director of Space Syntax, London, United Kingdom, and part of the Advisory Board of the Norman Foster Foundation, will chair the debates. e-flux Architecture is a sister publishing platform of e-flux, archive, and editorial project founded in 2016. The news, events, exhibitions, programs, journals, books, and architecture projects produced and/or disseminated by e-flux Architecture describe strains of critical discourse surrounding contemporary architecture, culture, and theory internationally. Since its inception, e-flux Architecture has maintained a dynamic international program of projects and events in collaboration with leading institutions and practitioners. Editorial content commissioned and published by e-flux Architecture consistently showcases rigorous, critical, sincere and engaged theoretical work being produced today in and around the fields of architecture, urbanism, and design. Could the new technologies change the reality and perception of new ways of transportation? 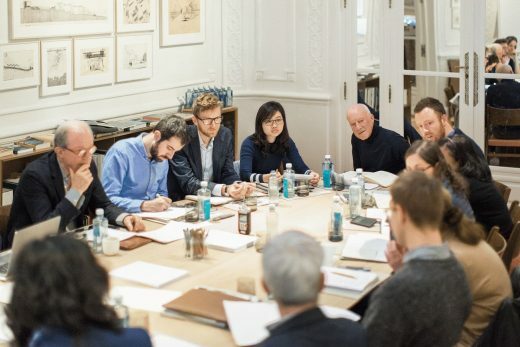 The Norman Foster Foundation presents its Urban Mobility Workshop with a public debate with the participation of Alfredo Brillembourg, Tilly Chang, Norman Foster, Carlo Ratti and Tim Stonor. The 2018 Urban Mobility public debate will explore how new technologies could open up an exciting range of opportunities in the infrastructure of movement. • Norman Foster Foundation presents its annual On Cities Workshop with the support of Bloomberg Philanthropies. • The 2018 On Cities Workshop will explore the premise that emerging urban innovations can create more livable, entrepreneurial communities and dramatically reduce resources consumed by cities, in a week-long event hosted in the Madrid headquarters of the Norman Foster Foundation. • A distinguished group of specialists will engage with ten selected students from ten universities around the world sharing a common interest in the subject. This year’s workshop mentor is Kent Larson, Director of MIT Media Lab City Science Group and Initiative. The Norman Foster Foundation On Cities Workshop will take place on 18-22 June 2018, supported by Bloomberg Philanthropies, closing the 2017-2018 Educational programme initiative. The workshop will focus on Autonomous Innovative Communities, selecting a district in Madrid as a case-study for a research project that will be developed throughout the week. Can each community locally produce all of the energy, food, and clean water needed for basic living— requiring no centralised infrastructure? Can humans transition from ownership to sharing, while living and working in compact, agile, supportive environments? This workshop explores the premise that emerging urban innovations can dramatically reduce resources consumed by cities while simultaneously creating more livable, entrepreneurial communities. These ten students will engage with a group of specialists through a series of seminars and lectures culminating inafive day workshop led by the mentor Kent Larson, Director of MIT Media Lab City Science Group and Initiative, and his team. The On Cities Workshop will include seminars, lectures, one-to-one tutoring and urban architectural tours to learn more about the context of Madrid and it’s districts. During the course of the workshops, participants will have the opportunity to engage with the Norman Foster Foundation’s archive and research projects. Nicholas Negroponte, Co-Founder and former Director of MIT Media Lab, Cambridge, United States will act as the Chief Advisor of the workshop tutoring the students through the research process. 19th June 2018 6 p.m.- 8 p.m.
Bloomberg Philanthropies works in over 120 countries around the world to ensure better, longer lives for the greatest number of people. The organisation focuses on five key areas for creating lasting change: Arts, Education, Environment, Government Innovation, and Public Health. Bloomberg Philanthropies encompasses all of Michael R. Bloomberg’s charitable activities, including his foundation, corporate and personal giving. In 2017, Bloomberg Philanthropies distributed $702 million. • Norman Foster Foundation presents its first Digital X Workshop with the support of Future Planet Capital. • The 2018 Digital X Workshop will explore the kinship of Architecture and the Digital World in a week-long event hosted in the Madrid headquarters of the Norman Foster Foundation. • A distinguished group of specialists will engage with ten selected students from ten universities around the world sharing a common interest in the subject. This year’s Atelier mentor is Nicholas Negroponte, cofounder and former director of MIT Media Lab. The first Norman Foster Foundation Digital X Workshop will take place on 15-19 January 2018, supported by Future Planet Capital. What happens when the natural world and the artificial world become one and the same? How does society change when direct brain communication occurs among humans, and between humans and machines? The workshop will focus on this kinship, that of architecture and the digital world, how the two play together now, and how they will change the world together, going forward, discussing things that, outrageous today, will be commonplace tomorrow. After reviewing applications submitted by hundreds of candidates from around the world, the selection committee awarded ten scholarships to students from the following universities and institutions: Architecture and Geomatics, University of Cape Town, South Africa; Architecture and Urbanismo Faculty (USP), Sao Paolo, Brazil; Bartlett School of Architecture, London, UK; Centre for Urban Science and Engineering IIT, Bombay, India; City Futures Research Centre, University New South Wales, Australia; National University of Singapore (NUS), Singapore; Stanford Department of Civil and Environmental, California, US; Technion Institute of Technology, Tel Aviv, Israel; Technische Universiteit Delft (TU), The Netherlands and Universidad Politécnica de Madrid, Madrid, Spain. These ten students will develop an essay ontheme of Digital X tutored by a group of specialists through a series of seminars and lectures culminating in a five day workshop led by the Atelier mentor, Nicholas Negroponte, co-founder and former director of MIT Media Lab. The Academic Body includes: Ricky Burdett, Director of LSE Cities and Urban Age Programme; Hugh Herr, Co-Director of the MIT Center for Extreme Bionics; Kent Larson, Director of MIT City Science Iniacitive; Amanda Levete, Founder and Principal of AL_A; Greg Lynn, Professor at UCLA School of Arts and Architecture; Farshid Moussavi, Principal of Farshid Moussavi Architecture and Benedetta Tagliabue, Principal of Miralles Tagliabue EMB Architects. As a way to disseminate knowledge and ideas, the public lectures will be recorded and documented for publication in series of annual books published by the Norman Foster Foundation. During the course of the workshops, participants will have the opportunity to engage with the Norman Foster Foundation’s archive and research projects. • 6:30 p.m. – 7:00 p.m.: Dialogue between Hugh Herr and Kent Larson, moderated by Ricky Burdett. • 7:00 p.m. – 7:30 p.m.: Dialogue between Greg Lynn and Benedetta Tagliabue, moderated by Luis Fernández-Galiano. • This year’s Robotics Atelier, related to design and building, will be explored in a week-long event hosted in the Madrid Headquarters of the Norman Foster Foundation. • A distinguished group of specialists will engage with ten selected students from ten universities around the world who share a common interest in the subject. This year’s Atelier mentor is Professor Mathias Kohler from the Swiss Federal Institute of Technology (ETH) in Zurich. The first Norman Foster Foundation Robotics Atelier will take place on 20-24 November 2017, supported by the Rolex Institute. Society is on the edge of being transformed through robotics and artificial intelligence. These technological innovations have the potential to change every aspect of our lives in far-reaching ways. Last June, in the Norman Foster Foundation’s inaugural forum ‘Future is Now’, a glimpse was given into how the world of construction would be revolutionised by these developments in what could prove to be a second digital era. Ten scholarships have been given to students selected by the following universities and institutions: The Bartlett School of Architecture, University College London, UK; Institute for Computational Design and Construction (ICD), Stuttgart, Germany; Universidad Politécnica de Madrid (UPM), Madrid, Spain; National University of Singapore (NUS), Singapore; Indian Institute of Technology (IIT), Mumbai, India; Massachusetts Institute of Technology (MIT), MA, USA; Universidad Iberoamericana de Ciencias y Tecnología, Santiago, Chile; Ashesi University, Accra, Ghana; Swiss Federal Institute of Technology (ETH), Zurich, Switzerland; Institute for Advanced Architecture of Catalonia (IAAC), Barcelona, Spain. The selected students will engage with a group of specialists through a series of seminars and lectures culminating in a five days workshop led by the Atelier mentor, Professor Mathias Kohler and his team. Leading robotics manufacturer Universal Robots will loan three units of their highly flexible robot arm, the UR5 Robot, to the Atelier. Contributors to the workshop include Luis Miguel Ciprés, CEO of Barrabés Next, Pablo Jarauta, Coordinator of the European Institute of Design (IED) Scientific Committee, Amelie Klein, Curator at Vitra Museum, and Gijs Van der Velden, Co-CEO of MX3D. The Robotics Atelier will include workshops, seminars, lectures, one-to-one tutoring, and development of projects by the students. As a way to disseminate knowledge and ideas, the public lectures will be recorded and live-streamed through the Norman Foster Foundation’s website: www.normanfosterfoundation.org. The lectures will be documented for publication in an annual series published by the Norman Foster Foundation. During the course of the workshops, participants will have the opportunity to engage with the Norman Foster Foundation’s archive and research projects. The Norman Foster Foundation promotes interdisciplinary thinking and research to help new generations of architects, designers and urbanists to anticipate the future. We believe in the importance of connecting architecture, design, technology and the arts to better serve society and in the value of a holistic education that encourages experimentation through research and projects. The Norman Foster Foundation holds the Norman Foster Archive and Library, which provide a window into the larger narrative and history of our built environment through the work of Norman Foster. The Norman Foster Foundation is based in Madrid and operates globally. Driven by an unwavering pioneering spirit, Rolex SA is renowned for its many technical innovations in watchmaking that have made it a symbol of excellence around the globe. The company brand values of quality, know-how and individual achievement pervade all of its endeavours. Rolex is closely linked to many of the world’s highest achievers and, since its beginnings, has supported visionary men and women in a variety of fields. The Rolex Institute embodies this philosophy. Comprising the company’s philanthropic programmes and educational initiatives, it aims at recognizing excellence and making a significant contribution to society. 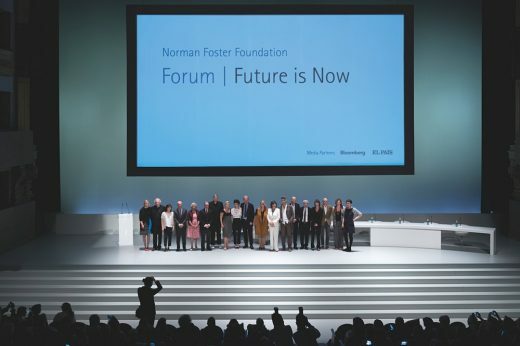 On June 1st 2017, the Norman Foster Foundation officially launched in Madrid with the forum, ‘Future is Now’. Scholars, students, thinkers, and practitioners from the fields of architecture, design, and technological innovation were invited to discuss the most pressing concerns regarding the built environment. The forum successfully challenged preconceived ideas about the future of our cities through diverse points of view. Forum – Future is Now | Norman Foster Foundation from Norman Foster Foundation on Vimeo. More than 2,100 people attended the event, 1,057 of whom were students from 32 international universities. To watch the complete forum go to Forum – Future is Now.